Healthy pets need ongoing care and attention, and no matter what age your dog or cat, the 365 Care Plan is	designed to meet your pet’s needs, at an affordable price. Because Oakhill Veterinary Centre puts an emphasis on preventative health care, we have developed the 365 Care Plan to ensure that your pet is protected against preventable diseases – providing annual vaccinations, parasite control and general health checks. The 365 Care Plan also offers discounts on various other products and services. 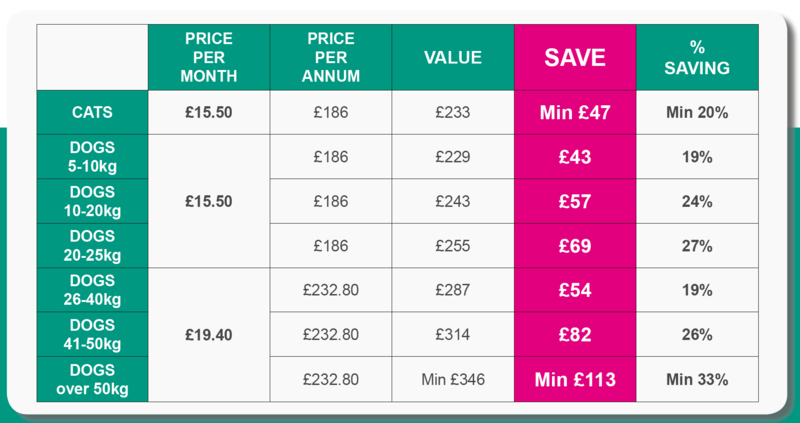 Paying for the plan is easy and affordable, offering great savings and the option of paying monthly by direct debit or annually. Using the 365 Care Plan for my dog, Dexter, has saved me money and it also prompts me to remember my flea and worm treatments.